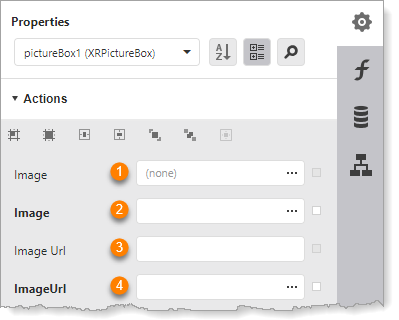 You can include images in reports by using the XRPictureBox control . Open the report in Report Designer. Drag an XRPictureBox control to the desired location in the layout. Click Properties to open the Properties panel, select the control from the Properties drop-down list, and expand Actions. Alternatively, you can select the control on the design surface instead of from the drop-down list. Click the icon in the Image box at to select the file in your workstation's file system. This option embeds a copy of the image in the report. Because the image is embedded, any changes to the source file on your workstation will not be reflected in the report. In the Image box at , type or paste an expression that defines a field in a SQL database that contains image content. Alternatively, click the icon to use the Expression Editor. In the Image URL box at , type or paste the image's URL. In the Image URL box at , type or paste an expression that defines the image's URL. The control on the design surface may not show exactly what the image will look like in the generated report. To see the image's final appearance, preview the report. The image file's location is the only required configuration. You can now preview the report if you want. In the Properties panel, expand Appearance | Padding and configure the Left, Right, Top, and Bottom settings in pixels. Normal: Positions the image at the upper, left corner of the control, at its actual size. Stretch Image: Changes the image's size and proportions to fit the control. Auto-Size: Changes the size and proportions of the control to fit the image. Enlarges the band if necessary. Center Image: Positions the image at the center of the control, at its actual size. Zoom Image: Centers the image and shrinks or enlarges the image to fit the control if necessary. Note that enlarging the image may reduce the quality. Squeeze: Centers the image and shrinks the image to fit the control if necessary. If you have also configured padding, the image's position accommodates the padding. Other Settings: (optional) Configure any other settings that you want. Some common settings are described in Common Properties of Controls. Click Preview to verify your configuration. You can associate a hyperlink with an image by using the Navigation settings. This allows the user to click the image to point their browser at the specified destination. For example, you may want the user to be able to open your corporate website by clicking your company's logo. Add the image to the report as described above in Configure an Image. Click Properties to open the Properties panel, select the control from the Properties drop-down list, and expand Navigation. In the Navigation URL box, type or paste the URL that you want the image to link to. To test the link, preview the report. Click the image in the preview to follow the link.